The first two festivals I attend this summer are a study in contrasts. The first, the Bill Monroe Bean Blossom Bluegrass Festival, is a hyper-traditional “Mecca of Bluegrass.” The countryside surrounding Bean Blossom, in Brown County, Indiana, is filled with rolling hills, big forests, and small towns. A permanent wooden stage sits in the middle of the music park, and an American flag hangs behind bands playing on the stage. People set their lawn chairs in the field in front of the stage at the start of the ten-day festival and leave them there for the entire festival; since people wouldn’t watch every act, you could take a seat in somebody else’s lawn chair until the owners came back. Around the stage, dirt roads with names like “Ralph Stanley Road” and “Jimmy Martin Drive” circle through the campground, which is mostly dominated by trailers and RVs. Tent camping is mostly in a back corner of the campground, in a part of the park that Bill Monroe once christened “hippy hill.” There’s a pond on the property, and mules and goats are kept back behind the pond. My summer so far has been pretty all-American: I’ve mostly been driving. I will be spending the summer in and around Asheville, NC, looking at the relationship between bluegrass music and community building. I’ll be playing my mandolin, going to bluegrass festivals, and talking to as many people as I can about their experience in the bluegrass community. To do all of that, I decided I would need access to my car. So I left Portland a few days after commencement and drove east, past Mt. Hood and out into the Oregon desert. I went through Boise and then through the sagebrush and fuzzy country radio of Eastern Utah and Northwestern Colorado, stopping for a week to spend time in the mountains with my family. After that, I was on the road again, down from the mountains and across Kansas. Kansas is as flat and featureless as advertised, but they make up for it with high-quality billboards: paintings of Jesus peaking out from a wheat field and advertisements for the world’s largest prairie dog (50 feet tall! ), along with the typical “click it or ticket” reminders. I stopped for a night on the banks of the Mississippi River in Alton, IL, the town where my dad grew up, and went on to camp in Mammoth Cave National Park in Kentucky. After Kentucky, I had to make a stop in Nashville, Tennessee. Nashville is the epicenter of country music in a lot of ways, but I went there for only one reason: I wanted to see the Ryman Auditorium. The Ryman is the mother church of country music and the place where the Grand Ole Opry radio show was originally broadcast. Almost every major star in country and bluegrass music has performed on the Grand Ole Opry, and it’s where the father of bluegrass music, Bill Monroe, really became famous. Monroe and his Bluegrass Boys played “Mule Skinner Blues” the first time he played there. Apparently it was so good that the audience demanded an encore – the first time they had done so at the Opry. 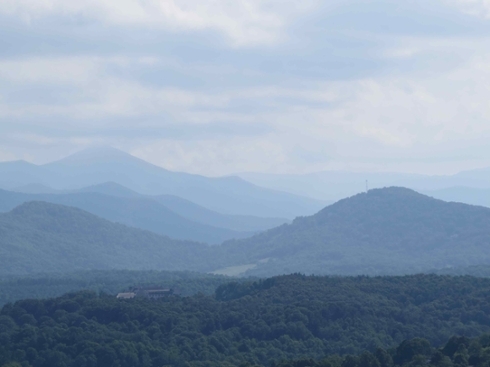 I had to navigate through Nashville’s CMA Music Fest to get there, but I saw the Ryman, resisted buying a t-shirt, and made my way on to Asheville.